Конверт, заводской CD. Серия Artbeat Club Edition. Алексей Козлов – альт-саксофон (5). I listened to your CD on the way back from Rochester to my home in Connecticut. I think your trio is the most exciting group I have heard in recent times. I am making copies of your CD to give to my musician sons and to the instructor at my jazz Institute at the University of the Pacific in California. I am amazed to think that I have had any influence on your group. The only way I could have influenced you was my belief that one should honestly reflect one's own culture, and the entire world can become integrated into jazz. There is no need or value in sounding like everyone else. I believe that each person and each group is unique, or should be, and I am excited by what I hear from your "second approach". It's not only an alternative, a second approach, but the right approach, drawing from one's own background and telling one's own story. Congratulations! Посткриптумом – письмо от Дариуса Брубека, сына Дэйва, написанное Дариусом в декабре 2015-го, после прослушивания «A Day For Dave». «I'm writing as I finish listening to A Day for Dave. 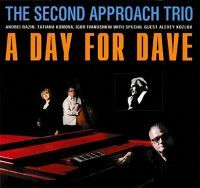 I am really enjoying the emotional intensity, virtuosity and indeed the clever way Dave's most famous compositions are present in the music. Only a musician or very astute listener would ­actually hear In Your Own Sweet Way and the other pieces so this is a truly creative tribute, as distinct from an album of 'cover' versions. I hope a discerning public will appreciate what The Second Approach has done here. This recording is very beautiful and moving. Thanks for sharing it with us and please convey my sincere compliments to Andrei Razin and the other musicians involved. You are all brilliant.